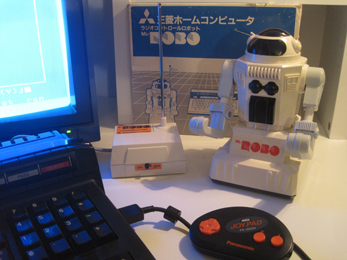 One of the objects recencently added to my collection, is the very rare Mitsubishi ML-ROBO 58L-900 MSX robot. In 2012 I bought this robot from another collector. This radio controlled robot is wireless and can be contolled with a MSX computer using the software programm on cassette which is added in the package. The robot is able to move in four directions (left, right, forward, reverse) because of a 4 channel wireless conection on 27 mHz..
With the software you can programm the movements the robot has to make in advance. The programmed tracks can be saved or loaded from disk. 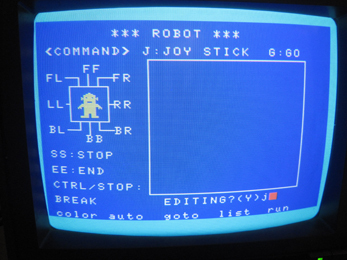 Also there is a possibillity to control the robot directly using a joystick or a joypad. Very cool!